Greek Interlinear Bible, ScrTR, ScrTR t, Strong, Parsing, CGTS, CGES id, AV. Chapter 3. The Blue Letter Bible. KJV, alternate versions, Greek text with concordance, commentaries. Chapter 3. The World Wide Study Bible includes commentary & sermons. Chapter 3. VII, 51; Tatian's Diatessaron (c. 150-160). Comparative texts about Sacred Days and Seasons (inc Sabbath) from DSS, Mishnah, Babylonian Talmud, etc., and Primary comparative texts of Rabbinic Wisdom (inc Sabbath and Passover restrictions) from Mahlon H. Smith's Into His Own: Perspective on the World of Jesus, Rutgers University. "[He] has the sabbath day in his power, and may rule it as he desires." "The sabbath is a sacred and Divine institution; a privilege and benefit, not a task and drudgery. God never designed it to be a burden to us, therefore we must not make it so to ourselves." "The Sabbath was made for man - And therefore must give way to man's necessity." "The Sabbath rest; that is, a rest of one day in seven was made for man, not for Jews only. This implies that it is to be a universal institution; that the good of man requires it, and that it is not an arbitrary enactment, but a wise and benevolent provision for the welfare of the race. Experience shows that men are happiest, most moral, most prosperous and healthiest where it is devoutly observed." "Conflict with Pharisees about Plucking Grain on the Sabbath," "Jesus Heals a Withered Arm in a Synagogue," Michael A. Turton's Historical Commentary on the Gospel of Mark, "a complete verse-by-verse commentary on the Gospel of Mark, focusing on the historicity of people, places, events, and sayings in the world of the Gospel of Mark." "Healings on the Sabbath," Gospel Analysis, Sermons from Seattle, Pastor Edward F. Markquart, Grace Lutheran Church, Seattle, Washington. Detailed background and exegesis. "The Lord of the Sabbath," Larry Broding's Word-Sunday.Com: A Catholic Resource for This Sunday's Gospel. Adult Study, Children's Story, Family Activity, Support Materials. "When was the last time you enjoyed a leisurely Sunday? What did you enjoy about the day?" Wellspring of the Gospel, Ordinary 9B, Catherine McElhinney and Kathryn Turner, Weekly Wellsprings. "Mark 2: Fasting and New Wineskins," "Mark 2: Plucking Grain on the Sabbath," "Mark 3: Healings," wikipedia. "The Eighth Day," David B. Capes, (other resources at) "Sabbath," Christian Reflection, 2006. "When they celebrated Sunday as 'the eighth day,' early Christian signaled that God's new creation had begun in the resurrection of Jesus Christ." "Did Jesus Get Angry?" Selected passages from the Gospels, at Beliefnet. Hultgren, Arland J., "The Formation of the Sabbath Pericope in Mark 2:23-28," Journal of Biblical Literature, 1972. Meier, John P., "The Historical Jesus and the Historical Herodians," Journal of Biblical Literature, 2000. Meier, John P., "The Historical Jesus and the Plucking of the Grain on the Sabbath," The Catholic Biblical Quarterly, 2004. Parsons, Mikeal C., "Between Text and Sermon: Mark 2:23-28," Interpretation, 2005. "Rest in Holy Time," the Rev. Duane Steele, Day 1, 1997. "Kevin and Philip Break the Rules," children's story by Larry Broding, word-sunday.com. "Crossword on Mark 1 & 2," Don Crownover's Bible Puzzles. 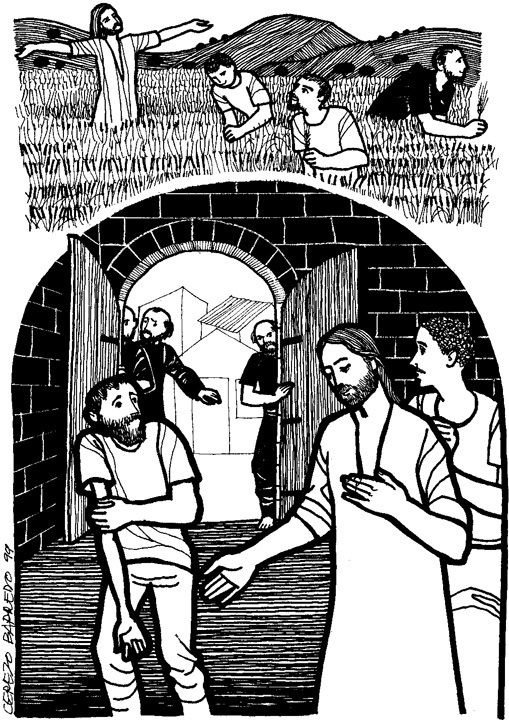 Mark 2:23 - 3:6, at Cerezo Barredo's weekly gospel illustration. Liberation emphasis.